Space Station Seventh Grade, Little, Brown (Boston, MA), 1982.
Who Put That Hair in My Toothbrush?, Little, Brown (Boston, MA), 1984. Night of the Whale, Little, Brown (Boston, MA), 1985. Jason and Marceline, Little, Brown (Boston, MA), 1986. Dump Days, Little, Brown (Boston, MA), 1988. Maniac Magee, Little, Brown (Boston, MA), 1990. The Bathwater Gang, illustrated by Meredith Johnson, Little, Brown (Boston, MA), 1990. There's a Girl in My Hammerlock, Simon & Schuster (New York, NY), 1991. Fourth Grade Rats, Scholastic (New York, NY), 1991. School Daze: Report to the Principal's Office, Scholastic (New York, NY) 1991.
Who Ran My Underwear up the Flagpole?, Scholastic (New York, NY), 1992. Do the Funky Pickle, Scholastic (New York, NY), 1992. The Bathwater Gang Gets down to Business, illustrated by Meredith Johnson, Little, Brown (Boston, MA), 1992. Picklemania, Scholastic (New York, NY), 1993. Tooter Pepperday, Random House (New York, NY), 1995. Crash, Knopf (New York, NY), 1996. The Library Card, Scholastic (New York, NY), 1997. Wringer, HarperCollins (New York, NY), 1997. Blue Ribbon Blues: A Tooter Tale, illustrated by Donna Nelson, Random House (New York, NY), 1998. Knots in My Yo-Yo String: The Autobiography of a Kid, Knopf (New York, NY), 1998. Stargirl, Knopf (New York, NY), 2000. Loser, Joanna Cotler Books (New York, NY), 2002. Contributor to books, including Our Roots Grow Deeper Than We Know: Pennsylvania Writers--Pennsylvania Life, edited by Lee Gutkind, University of Pittsburgh Press (Pittsburgh, PA), 1985, and Noble Pursuits, edited by Virginia A. Arnold and Carl B. Smith, Macmillan (New York, NY), 1988. Work represented in anthologies, including Best Sports Stories of 1982, Dutton and Connections: Short Stories by Outstanding Writers for Young Adults, edited by Donald R. Gallo, Delacorte (New York, NY), 1989. Maniac Magee was included in the anthology, Newbery Award IV, from Harper Trophy (New York, NY), 1998. Crash, Space Station Seventh Grade, Who Put That Hair in My Toothbrush?, and Wringer were all adapted for audiocassette by Recorded Books; Maniac Magee was adapted for audiocassette by Pharoah Audiobooks and for filmstrip by AIMS Media. Chilton Company (magazine publishers), Radnor, PA, editor, 1966-89; writer. Military service: U.S. Naval Reserve, 1966-72. Jerry Spinelli was born February 1, 1941, in Norristown, PA; son of Louis A. (a printer) and Lorna Mae (Bigler) Spinelli; married Eileen Mesi (a writer), May 21, 1977; children: Kevin, Barbara, Jeffrey, Molly, Sean, Ben. Avocation: Tennis, country music, travel, pet rats. Education: Gettsysburg College, A.B., 1963; Johns Hopkins University, M.A., 1964; attended Temple University, 1964. Best known for his Newbery-Award-winning book Maniac Magee, Jerry Spinelli's entire body of work is distinguished by his accurate and humorous depiction of adolescent life. Washington Post Book World contributor Deborah Churchman deemed Spinelli "a master of those embarrassing, gloppy, painful and suddenly wonderful things that happen on the razor's edge between childhood and full-fledged adolescence." While some parents may cringe at his characters' ribald jokes and risqué topics of conversation, this approach has earned the author both the respect and loyal following of young readers. Critics maintain that Spinelli is popular because he accepts kids for what they are. The author "neither judges nor berates but shakes everyone up in his own bag of tricks and watches to see what will spill out," according to Ethel R. Twichell in a Horn Book review of Spinelli's book Dump Days. Spinelli grew up in Norristown, Pennsylvania, and his first claim to fame was that a local paper published a poem he wrote about a hometown team's football victory. This experience left him eager to continue writing, and the author tried to match this success as an adult. Spinelli thought that because he was older he had to write about issues important to grownups. Publishers, however, were not interested in these topics. Spinelli found his narrative voice after he married. One of his children's feats--eating food that the author had been saving for a snack--inspired him to write, and this incident became part of his first novel, Space Station Seventh Grade. Spinelli once remarked in that when he started writing about youngsters he began "to see that in my own memories and in the kids around me, I had all the material I needed for a schoolbagful of books. I saw that each kid is a population unto him-or herself, and that a child's bedroom is as much a window to the universe as an orbiting telescope or a philosopher's study." Space Station Seventh Grade recounts the everyday adventures of Jason Herkimer, a junior high school student. With seemingly mundane events--such as masterminding classroom pranks and chasing after girls--the author traces Jason's awkward entrance into adolescence. Although Jason seems impulsive and has a penchant for getting into trouble because he speaks before he thinks, he must also contend with more serious issues, including coping with divorced parents and accepting a stepfather. Some critics disapprove of the crude humor Spinelli's characters sometimes use, but judge that the author accurately represents the adolescent milieu. Voice of Youth Advocates contributor James J. McPeak called the story "first-rate," and Twichell, writing in Horn Book, deemed Space Station Seventh Grade a "truly funny book." Spinelli followed Space Station Seventh Grade with Who Put That Hair in My Toothbrush? In this book, the chapters alternate between the first-person narration of Megin and Greg, a sister and brother two years apart with vastly different personalities. Greg is preoccupied with a possible romance, while sports-crazy Megin secretly befriends an elderly woman confined to a nursing home. The pair fights constantly, but when a crisis nearly erupts, they join forces. Critics appreciated Spinelli's humorous depiction of sibling rivalry mixed with his inclusion of weighty themes. In a review for Horn Book, Karen Jameyson credited the author with a "sure ear for adolescent dialogue" and called the book "hilarious." Jason and Marceline, published in 1986, serves as a sequel to Space Station Seventh Grade. Now a ninth grader, Jason again copes with the daily trials of adolescence. These include an attempted romance with Marceline, a trombone player who once beat him up. Marceline initially rejects Jason's advances because he tries to impress her the same bravado and macho behavior that his friends employ in their romantic conquests. When he shows his caring side in a heroic lunchroom incident, however, Marceline forgives Jason's antics and their relationship progresses. With Jason and Marceline, Spinelli earned praise for pointing out that respect and friendship are necessary in a loving relationship between people of any age. Writing again in Horn Book, Twichell noted that Jason "truly sounds like a teenager." Maniac Magee, Spinelli's Newbery Medal winner, is about an athletically gifted boy whose accomplishments ignite legends about him. Jeffrey Magee, a Caucasian boy nicknamed Maniac, is an orphan who has run away from his foster home. His search for a loving household is problematic in the racially divided town of Two Mills. Maniac's first stay is with a black family, but after racist graffiti is spray-painted on their house, he leaves. He spends several happy months with an old man in a park equipment room, but the man eventually dies. Maniac then moves into a white family's house that is filled with roaches, alcohol, and cursing. The sons are gang members and the entire family is racist. Maniac then tries his greatest feat--to initiate better relations between blacks and whites in Two Mills. Although some critics felt that Spinelli diluted his message about the absurdity of racism by presenting Maniac Magee as a fable, others believed the author's focus on such an incident was noteworthy. Alison Teal, in her New York Times Book Review appraisal, judged that "Spinelli grapples . . . with a racial tension rarely addressed in fiction for children in the middle grades." And Washington Post Book World contributor Claudia Logan lauded Spinelli's "colorful writing and originality." Spinelli produced both There's a Girl in My Hammerlock and Fourth Grade Rats in 1991. There's a Girl in My Hammerlock chronicles the adventures of Maisie Potter, an eighth-grade girl who tries out for her school's wrestling team. The school allows her to participate, but Maisie encounters various roadblocks, including her teammates' jealousy about the media attention she receives. Fourth Grade Rats focuses on peer pressure and growing up too fast. The main characters are Suds and Joey, two friends who decide they have to become tough and mean now that they are entering fourth grade. Nice-guy Suds initially balks at the plan, but Joey's relentless needling persuades him to reconsider. The experiment is short-lived, however, as both boys are forced to resume their normal behavior---and relieved when this happens. Spinelli has continued to create a body of amusing and fast-reading work for both young adult and younger readers. Tooter Pepperday and its sequel, Blue Ribbon Tales, aimed at a younger readership, feature a reluctant young transplant to suburbia and her adventures adapting to her new environment. Another series, for slightly older readers, is "School Daze," which includes Report to the Principal's Office, Do the Funky Pickle, Who Ran My Underwear up the Flagpole?, and Picklemania. Featuring four children, Eddie, Salem, Sunny, and Pickles, these books chronicle their antics at Plumstead Middle School. Sunny is a grump, Eddie is something of a wimp who is in love with Sunny, Salem is an aspiring writer, and Pickles is uniquely Pickles. In Crash, a smug jock is transformed into a more empathetic young person when Spinelli once again tackles gender roles in his typical bright and cheery first-person style. Seventh-grader Crash Coogan has the athletic ability of Maniac Magee but nowhere near that character's sensitivity to the feelings and needs of others. Crash happily bullies kids smaller than he, including Penn Webb, whom he has tormented since first grade; he even threatens a girl who rejects him. He is competitive about everything, even the love of his grandfather. It is finally a life-threatening stroke his grandfather suffers that shakes some humanity into Crash. A Publishers Weekly commentator maintained: "Without being preachy, Spinelli packs a powerful moral wallop, leaving it to the pitch-perfect narration to drive home his point." Reviewing the novel in School Library Journal, Connie Tyrrell Burns concluded that "readers will devour this humorous glimpse at what jocks are made of while learning that life does not require crashing helmet-headed through it." A library card becomes the ticket out of mundane and often impoverished lives for four youngsters in The Library Card. "These four stories feature different characters, styles, and moods," noted Steven Engelfried in School Library Journal, "but each plot hinges on a library card." Shoplifting Mongoose leaves his thieving ways behind when he enters a library for the first time and discovers a world of facts; Brenda is a TV addict who discovers a new world of invention in books; Sonseray recaptures memories of his mother in an adult romance title; a hijacker even falls under the spell of books in a bookmobile. A Publishers Weekly critic felt that "while the premise (the card) behind the stories may seem contrived, the author uses it effectively" in this collection of "four vaguely unsettling tales." Joan Hamilton asserted in Horn Book that "Spinelli's characters are unusual and memorable; his writing both humorous and convincing." With his 1998 Newbery Honor book, Wringer, Spinelli returned to the weightier themes and style that made Maniac Magee so popular with critics and readers alike. A tenth birthday is something to be dreaded for nine-year-old Palmer LaRue. At that time he will qualify as a wringer, one of the boys who wrings the necks of wounded birds in the annual pigeon shoot in Palmer's hometown, Waymer. While other kids can't wait to perform this role, Palmer is different. He secretly harbors a pet in his room, a stray pigeon whom he has taken in and called Nipper. Palmer leads a double life--one of the boys but not really--until he turns ten and the pigeon shoot comes. Ultimately, he is forced to be true to his own feelings when his pet Nipper is endangered. In a School Library Journal review of Wringer, Tim Rausch listed the laudable aspects of the novel: "Humor, suspense, a bird with a personality, and a moral dilemma familiar to everyone," characters who are "memorable, convincing, and both endearing and villainous," and a "riveting plot." Suzanne Manczuk, writing in Voice of Youth Advocates, commented that "Spinelli has given us mythic heroes before, but none more human or vulnerable than Palmer." Writing in the New York Times Book Review, Benjamin Cheever had high praise for Spinelli's Wringer, "a story both less antic and more deeply felt than (Maniac Magee)." Cheever drew attention to the manner in which Spinelli was able to create a morality tale without preaching: "I am deeply grateful for Spinelli's willingness to present a moral question. . . . He does this with great care and sensitivity." Another moral issue is probed in Stargirl, a novel about nonconformity and popularity. When the eponymous protagonist enters Mica High School, an all-white middle-class school in Arizona, she attracts considerable notice for her off-beat behavior: she wears odd clothes, plays the ukelele, and cheers for both sides after making the cheerleading squad. Though Stargirl is initially admired, her popularity doesn't last and she is eventually shunned. Some reviewers found the novel one-dimensional and heavy-handed; as Ilene Cooper put it in Booklist, the protagonist's character is so unbelievable that "readers may (at times) feel more sympathy for the bourgeois teens than the earnest, kind, magic Stargirl." Others, however, praised Spinelli's handling of a complex and relevant theme. "As always respectful of his audience," wrote a reviewer for Publishers Weekly, "Spinelli poses searching questions about loyalty to one's friends and oneself and leaves readers to form their own answers." For those interested in the inspiration for much of Spinelli's work as well as an introduction to the early life of the writer, Spinelli's partial autobiography, Knots in My Yo-Yo, is an indispensable guide. Publishers Weekly called this 1998 memoir a "montage of sharply focused memories," concluding that as "Spinelli effortlessly spins the story of an ordinary Pennsylvania boy, he also documents the evolution of an exceptional author." Spinelli, often irreverent and sometimes crude to the adult ear, has a knack for speaking to young readers. As Booklist reviewer Hazel Rochman maintained, whether it is gender roles he is writing about, as in There's a Girl in My Hammerlock, or the power of myth, as in Maniac Magee, or a bevy of kids learning the joys of the library, as in The Library Card, Spinelli "is able to convey the message with humor and tenderness and with a fast-talking immediacy about the preteen scene." Spinelli continues to create witty, refreshing books for young readers and it appears there will be no shortage of ideas for future volumes. In his Newbery Award acceptance speech excerpted in Horn Book, the author recounted his conversation with a group of schoolchildren. When they asked him where he gets his ideas, the author replied, "from you." Spinelli continued, "You're the funny ones. You're the fascinating ones. You're the elusive and inspiring and promising and heroic and maddening ones." 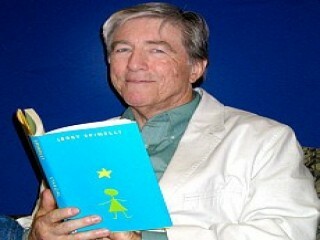 View the full website biography of Jerry Spinelli.